Rookie Derek Stepan, who scored the Rangers' goal at 8:23 of the third peroid, shows his defensive abilities as he comes back into his own zone to keep the puck away from Philadelphia's Danny Briere. Recently, the Rangers have owned the third periods of games they have played in and, as a result, have strung together an impressive series of victories. But on Saturday afternoon at the Wells Fargo Center in Philadelphia, the Rangers entered the third period trailing 1-0 and allowed three more goals to end up losing to the Flyers 4-1. The loss was the Rangers’ first this week after winning three straight -- including inspiring third-period comebacks against the Penguins and Coyotes. The Flyers have now won five in a row, and their 49 points are tops in the National Hockey League. Philadelphia scored the only goal of the first two periods when former Ranger Nikolay Zherdev burst out of the penalty box, accepted a long pass from teammate Mike Richards, and scored on a breakaway against Henrik Lundqvist at 9:06 of the second period. Tortorella termed that score “a pretty important goal” because neither team had generated much in the way of quality scoring chances to that point. Philadelphia had the better of the play for much of the game, and Lundqvist -- who finished with 35 saves -- was clearly the Rangers’ best player on the ice. 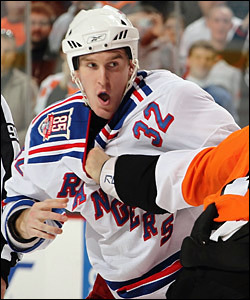 Dale Weise, a 2008 draft pick, nearly scored two goals and then traded punches with Dan Carcillo late in the third period of his NHL debut. Following the game, Weise was returned to the Connecticut Whale, where he will be available to play Sunday. Entering the third in familiar territory -- trailing on the scoreboard -- the Rangers were confident, based on their recent successful rallies against Pittsburgh and Phoenix this past week. In fact, the Rangers entered play on Saturday with a 4-7-1 record in games they trailed after two periods of play. However Andreas Nodl was left wide open to the side of Lundqvist’s cage just 3:19 into the third period, and he shoveled his eighth goal into the gaping cage to give Philly an important two-goal lead. The Rangers thought that they had pulled to within a goal at 5:35 of the third, but the referees disallowed an apparent goal by rookie Dale Weise contending that he directed the puck into the net with a distinct kicking motion. Video review upheld the on-ice call, as the Rangers were denied their first goal of the game, and Weise was denied his first NHL goal while making his NHL debut. Ironically, Weise, who saw limited time playing on the fourth line in his NHL debut on Saturday, nearly scored earlier in the second period, as well. On that play Weise broke in on right wing and hammered a shot on goal that went between goaltender Brian Boucher’s pads, but ended up rolling just wide of the cage. 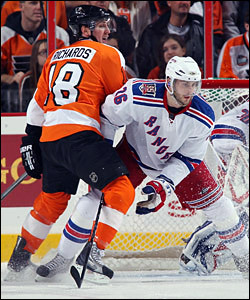 Rangers forward Erik Christensen, who had some good scoring chances and picked up an assist, plays a little defense against Philadelphia Flyers captain Mike Richards in front of goalie Henrik Lundqvist. Weise also made his presence felt late in the game, impressing Tortorella and his teammates by dropping the gloves with Philadelphia’s rugged Daniel Carcillo, landing the more telling blows along the way. Stepan finally broke through against Boucher at 8:23 of the third, cutting the Flyers’ lead in half, 2-1. After shooting wide after breaking in past both Flyers’ defensemen, Stepan stayed involved in the play and converted a slick centering pass from Alex Frolov for his ninth goal, and second in as many games. However just 1:34 later, Ville Leino deflected Kimmo Timonen’s shot past Lundqvist and the Rangers were in a 3-1 hole. Zherdev scored his second of the game, and 13th of the season, to close out the scoring at 15:06. Although losing out on a perfect week against four top opponents eluded the Rangers’ grasp, it was still a successful week for the club, symbolic of what has been a very strong first half of the season, so far. The Rangers will have four days to rest up before their next contest which comes next Thursday at Madison Square Garden against the Lightning. That contest will be the Rangers’ only game in an eight-day stretch.